Description An excellent pen manufactured 1940's and carrying a 14 carat gold medium Sheaffer nib. Description An Australian made Touchdown in gold plate. Circa 1960s. Fitted with a 14 carat gold two-tone stub nib. Description An excellent converter fill Imperial in Sterling Silver made in the 1960's. Fitted with a 23 carat plated stub nib. Description New old stock Agio Compact fitted with a medium nib. Cartridge use only. Description 1960's manufacture in Sterling Silver "grapes & leaves" pattern. Very hard to find these days. In excellent working order. Description An excellent pen which has seen very little use. Fitted with 14 carat gold two-tone stub nib. Description A converter fill Legacy II in superb condition. A near mint pen fitted with an 18 carat fine Palladium nib. Converter supplied. Description A very interesting Connaisseur in gold plate and tortoiseshell laque cap featuring black cap button - an unusual colour combination. Cap clip is engraved with the name "Duncan Flockhart". Duncan Flockhart & Co was an old pharmaceutical company which operated from Edingburgh, Scotland. It is possible that the pen was a promotional item of that company. The pen has seen very little use. We have replaced the nib with a new Sheaffer 18 carat gold Fine nib and fitted a new Sheaffer piston converter to the pen. Manufactured late 1980's. Description Statesman Snorkel manufactured circa 1952. In excellent condition. Fitted with Fine Palladium nib. Description Statesman Snorkel manufactured circa 1952. In excellent condition. Fitted with Extra Fine Palladium nib. Description Valiant Touchdown Mk II fitted with Fine 14 carat two-tone gold nib. In excellent overall condition. Circa 1950's. Description A very near mint condition pen which still carries its original label on the cap. In perfect order and fitted with original converter which appears not to have been used. In "Modelo" colour and fitted with an 18 carat gold Fine nib. No, we didn't invent the curious (and unfortunate) spelling of the name of this model. Sadly, Sheaffer did! Description Mint condition Sheaffer Imperial cartridge/converter model fitted with 23 carat gold plated Fine nib. Fitted with Sheaffer piston converter. 1980's manufacture. Description A sought after Sterling Silver Imperial Sovereign in Touchdown filler. Circa 1960's. With burgundy section and two-tone 14 carat gold Fine nib. Usual minor dents to cap and barrel ends. Description A charming Tuckaway manufactured 1940's and fitted with a Medium nib. Description A brown striated Vac Fill manufactured circa 1940's and fitted with a Fine nib. Description A near mint 444 in brushed stainless steel and fitted with a Fine Palladium nib. Fitted with original Sheaffer metal converter. Circa 1960. Description A perfect Imperial cartridge filler with Palladium trim and fitted with a Medium Palladium nib. Description A 1950's Admiral Snorkel fitted with a two-tone 14 carat gold Medium nib. Engraving to cap band. Description An interesting 1960's model Touchdown fitted with a Medium nib in a "Dolphin" style shell. Description An American manufactured pen fitted with an Australian made Sheaffer 14 carat gold fine nib - not an unusual combination by Sheaffer standards. In excellent condition. Description In excellent condition and fitted with a new old stock 23k gold plated fine nib. Carries original piston converter. Manufactured circa 1972 in 14 carat gold filled. 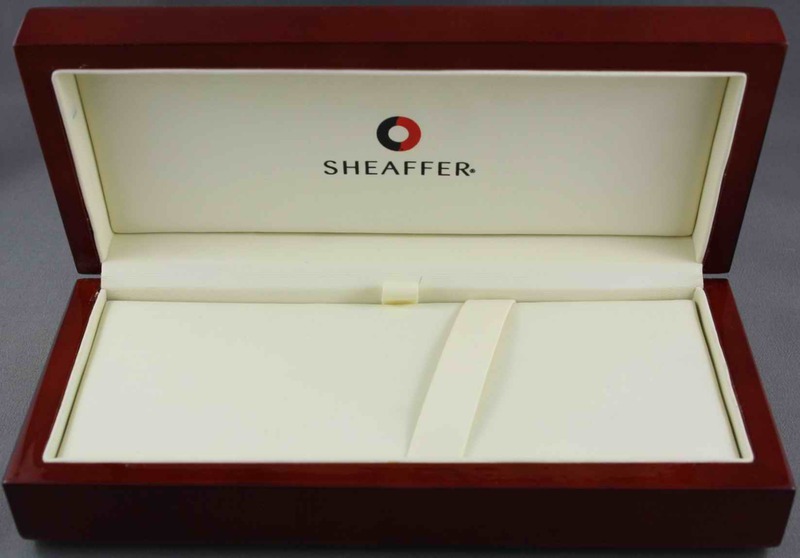 Description New Sheaffer gift boxes in superbly polished Rosewood. These were used in Sheaffer's higher end pens from late 1990's until mid 2000's. Several available. In perfect order and with cardboad outers. Description Near new pen fitted with Extra Fine nib in excellent condition. Description Manufactured 1950's with Sheaffer 14 carat gold two-tone Fine nib. Description An Australian made Sentinel carrying 14 carat gold Sheaffer Fine nib. Description A faultless mid-sized Sheaffer Lifetime in abalone. Fitted with 14 carat gold Sheaffer two-tone Fine nib. Description A Snorkel Masterpiece. An Australian made pen featuring a gold-filled cap and and Australian two-tone 14 carat gold Sheaffer Extra Fine nib. Description A Sheaffer Touchdown Mk II. An Australian made pen with a Fort Madison barrel. Fitted with an Australian 14 carat gold Broad Sheaffer nib. Description Sheaffer Snorkel Masterpiece. An Australian pen with a Fort Madison barrel. Fitted with an Australia 14 carat gold two-tone Extra Fine nib. Description Manufactured circa 1972 in 14 carat gold filled with 23 carat gold plated stub nib. In mint and unused condition save for very minor pitting to cap clip. Supplied with converter. Description Model 727 Triumph Imperial Stylist in 12 carat gold filled with 14 carat gold fine nib. In mint and unused condition. Manufactured circa 1970. Supplied with converter. Description Imperial Touchdown Mk II Valiant with extra fine two-tone 14 carat gold nib. In near mint condition. Manufactured circa 1956. Description Manufactured circa 1972 in 14 carat gold filled with 23 carat gold plated stub nib. In mint and unused condition. Supplied with converter. Description In gold plated fine barleycorn pattern. Manufactured circa 1972 with 14 carat gold fine nib. In mint and unused condition. Supplied with converter. Description Imperial Touchdown Mk II circa 1958 fitted with 14 carat two-tone gold stub nib. In near mint condition. Description Imperial Touchdown Mk IV in gold filled line pattern fitted with 14 carat gold extra fine nib. Manufactured circa 1973. Description Model 2797 Triumph Imperial Manufactured circa 1995. Fitted with 14 carat gold broad nib. Condition Mint and unused. Supplied with converter. Description Manufactured circa 1972 and fitted with extar fine 14 carat gold nib. In mint and unused condition. Supplied with converter. Description In mint condition save for evident plating imperfections on barrel. Fine palladium nib. Supplied with correct Intrigue converter. Description In mint condition save for minor coating imperfections on both barrel and cap. Medium palladium nib. Supplied with correct Intrigue converter. Description Model 72 Triumph Imperial in chrome trim. Circa 1976 and fitted with a medium palladium nib. The pen is unused and in mint condition. Supplied with converter. Description Sterling Sliver Imperial Triumph fitted with a 14 carat gold fine nib. Manufactured circa 1972. Very minor dings to tops of barrel and cap. Supplied with converter. Description Sterling Silver Imperial Touchdown Mk III fitted with a palladium broad stub nib. Manufactured circa 1970. Very minor ding to top of TD blind cap. Description Sterling Silver Imperial Touchdown Mk III fitted with a palladium broad stub nib. Manufactured circa 1970. Very minor ding to top of cap. Description New old stock Balance II Special Edition fountain pen and ballpoint set in Amber Glow Marble. Some of the last pens manufactured in Sheaffer's Fort Madison facility in 2000. 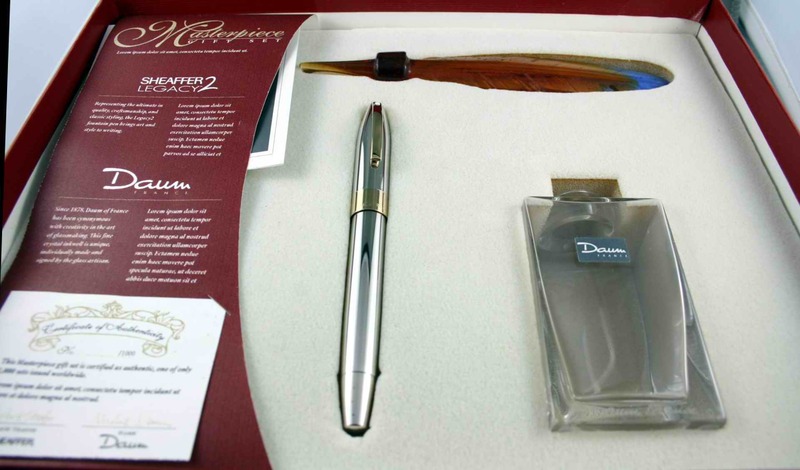 Fountain pen features 18 carat gold/palladium "Feather Touch" Medium nib. Uninked and in Mint condition and in Rosewood presentation box. Description Fitted with Fine nib and manufactured circa 1952 in rare Mandarin colour. A very desirable Snorkel for the collector. Description Circa 1950's with Fine nib and in excellent overall condition. Description Manufactured in Fern colour circa 1950. In excellent condition with a Medium nib. Description Manufactured circa 1950's in pale blue and fitted with a Broad nib. In very good overall condition. Engraved name on barrel. Description Manufactured 1950's in burgundy and fitted with a Fine nib. In superb condition. Description An Australian made Touchdown made late 1960's fited with a Fine nib. Barrel has an interesting engraving "To Jim from the boys at Sands". Description An Australian made Imperial in touchdown filling mechanism fitted with the "fingernail" nib in burgundy. Fine nib. Description Circa 1962 and fitted with a Fine nib. In perfect condition. Description Vac Fill manufactured 1940's. Fitted with a fine 14 carat gold two tone nib and in nickel plated fittings. Description Vac Fill manufactured 1940's. Fitted with a fine 14 carat gold two tone nib. Description New old stock manufactured circa 1970 fitted with fine nib and supplied with converter. Stainless steel nib. Description New old stock Imperial Touchdown manufactured circa 1970's. Fitted with extra fine 14 carat gold nib. Description Canadian made Feathertouch 500, circa 1945. Good barrel and cap with small scuff marks. Fitted with Sheaffer 14 carat gold Canadian made fine nib. Description A very clean Imp Touchdown made circa 1962. Carries a 14 carat gold semi-hooded medium nib. Description Black matte and gold plate Prelude fitted with two-tone plated fine nib. Fitted with original converter. Description Fineline L150 in mint condition. Fitted with medium steel Fineline nib. 1950's production. Description Lifetime Junior Flat Top circa 1924 fitted with 14 carat gold Lifetime fine nib. Light brassing to lever and obvious, light discolouration of lower barrel. Description Mint fountain pen and ballpoint set. Pen still carries chalk marks and is fitted with fine steel nib. Fountain pen fitted with original converter. Description A very well presented Statesman fitted with 14 carat gold fine nib. Circa 1952. Engraved name and (telephone?) number on barrel. Description Grey Admiral produced circa early 1950's with 14 carat gold LH oblique nib. Description Pale Green Admiral Snorkel circa 1950's with 14 carat gold two-tone fine nib. In perfect condition. Engraved initials on barrel. Description Circa 1950's made in Australia in burgundy and fitted with Australian made 14 carat gold Sheaffer No 5 medium nib. Perfect condition. Description Circa 1950's made in Australia and fitted with Australian made 14 carat gold Sheaffer No 5 medium nib. Perfect condition. Description Made 1952 in burgundy and fitted with an Australian "Palladium SIlver" medium nib. Light scratches to barrel and cap. Description A very early Sheaffer lever filler in black hard rubber. No significant fading. Even and very light fading to entirety of pen. Sheaffer 14 carat gold Extra Fine nib with reasonable tipping. Very slight brassing to two patches of cap ring. Circa 1922. Description Jade green ring top circa 1920. Barrel fading/staining as depicted, cap fading/staining is somewhat better. Minor cap lip cracks. Sheaffer 14 carat gold Fine nib. Description Balance Lifetime Senior. Circa 1925 in bright green jade. Good colour. Minor brassing to cap clip ball and cap ring. Sheaffer 14 carat gold Fine nib. Description Black and Pearl Junior Flat Top circa 1923. Barrel fading is evident. Brassing only to point of cap ring keeper. Superficial, circumferential scratches (not cracks) to cap. Minor cap lip crack. Sheaffer 14 carat gold Extra Fine nib. Description A very interesting and uncommon 275 in Abalone circa 1935. Minor brassing to cap ring. Sheaffer 14 carat gold Extra Fine nib. Description A quality Feathertouch green striated with military clip. Circa 1941. No faults or vices. Good plating. Sheaffer 14 carat gold Fine nib. Description Oversize Balance Lifetime Senior in green pearl and black circa 1933. Good plating. Sheaffer 14 carat gold Fine nib with basic amount of tipping remaining. Description Circa 1933 and engraved "Compliments Dixon Prosser". Some idiot tried to remove the engraving but the savage damage has been minimised. Has an obvious barrel crack which is unrepaired. Sheaffer 14 carat gold Extra Fine nib. Good plating. Shame about the idiot! We like engraved pens as they show history, authenticity and character. Good nib and parts value alone. Description An excellent oversize Balance Lifetime Senior circa 1935. A pen which, if we collected, we would keep. Sheaffer 14 carat gold Fine nib. Intrigue with the short lever in the lever slot but, it is original. 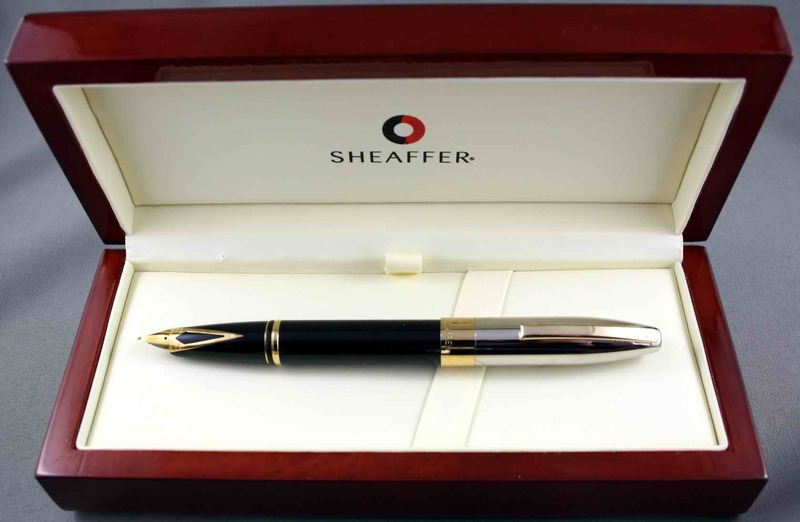 Description Sheaffer was anxious enter the ballpoint market and released the RAI Stratowriter in 1946. These gold-filled pens are in excellent condition and probably date from the 1950's. They once contained the original (and fat) aluminium refill which dried years' ago. The mechanisms of both have been (non-irreversably) converted to accept new style Sheaffer refills. No significant gold-filling defects. Both are a collector's delight. We have two of these available in virtually identical condition. Description Historically, a very significant pen produced 1946 and fitted with a Triumph Extra Fine two-tone 14 carat gold nib. A pin-prick dent in the cap band which is evident from the image. Description Oversize Balance in red vein/green circa 1929. Mild brassing to clip ball and clip top. Sheaffer 14 carat gold Fine nib. Description Balance in black and pearl - circa 1929. Sheaffer 14 carat gold Fine nib. Fading to barrel is clear from the image. Brassing to cap band. Description A classic oversize Senior Balance in Abalone - circa1935. Good plating and markings. Engraved name on barrel. Sheaffer 14 carat gold Extra Fine nib. Description A quality black Oversize Balance - circa 1935. Very minor brassing to cap band. Sheaffer 14 carat gold Fine nib. Description A nice Balance Lifetime Senior in bright green jade - circa 1924. Very light brassing to one edge of cap ring and part of clip ball. Good colour. Sheaffer 14 carat gold Fine nib. Description Striated grey and silver - circa 1938 with nickel trim. Signs of brassing commencing on part of cap band but, nowhere near serious. Sheaffer 14 carat gold Very Fine nib. Description Brown striated Balance 1000 with military clip - circa 1941. Sheaffer 14 carat gold Extra Fine nib. Description An excellent Balance Vac Fill but, we suspect the clip has been glued into the cap with epoxy resin. Removing the blind cap shows no evidence of the usual internal lugs used to attach the clip. However, the clip is soundly anchored to the cap and shows no signs of movement or evidence of potential failure. Leaving that issue aside, a very good vac fill with Sheaffer 14 carat gold Very Fine nib. In fairness, we do not warrant the clip/cap issue. Description Highly sought after compact Tuckaway where the cap screws to the back of the barrel when in writing mode. These were first manufactured in 1940 in lever filler form. This pen was manufactured in 1941 and is a Vac Fill. The compact Tuckaway was designed to fit in a lady's purse. These are very collectible pens. Sheaffer 14 carat gold Extra Fine nib. Gold filling is generally very sound with the odd pin prick blemish. A collector's gem! Description Balance Vac Fill in black with striated barrel. Sheaffer 14 carat gold Fine nib. Description Balance Vac Fill in striated green. Sheaffer 14 carat gold Medium nib. Description Lady Sheaffer with push button converter. Carries a Medium 18 carat gold Sheaffer nib. Description Gold filled (12 carat) Imperial circa 1976 with original converter. Fitted with a Fine 18 carat gold Sheaffer nib. Description Black Legacy II in with palladium and gold trim cap. This pen is a converter filler and fitted with a new Sheaffer converter. Carries a medium 18 carat gold Sheaffer nib. Housed in a handsome wooden Sheaffer presentation box. We have other Legacy's in similar packaging and with different nib styles available. Description Legacy II in Palladium with gold trim matched with a Daum (French) ink well with hand-made glass "feather" stopper. This set was produced in a limited edition of 1,000 and is extremely rare today. In Mint condition with box, papers and Certificate of Authenticity. Description Sheaffer Agio fountain pen in copper fitted with medium nib and Sheaffer converter. Description Sheaffer Lifetime circa 1943 in perfect condition. Fitted with a Sheaffer 14 carat gold two-tone Feather Touch No 5 nib. Description New old stock brushed stainless steel Agio with gold plated trim. Fitted with a gold plated Sheaffer Medium nib. Fitted with converter. Description New old stock Fineline made by Sheaffer's "Fineline Division" around 1960. The Fineline range was available with interchangeable nibs. Fitted with a Sheaffer steel Fine nib. Still carries the original clip tag. Description New old stock Crest 591 re-issue circa 1992. Fitted with 18 carat gold Sheaffer Broad nib and gold plated cap. Fitted with converter. Description Sheaffer Snorkel Saratoga circa 1952. Fitted with 14 carat gold two-tone Sheaffer Fine nib. Small crack in cap top which will not move further. Description Very good Sheaffer Balance in striated brown fitted with Sheaffer 14 carat gold two-tone fine nib. Very mild brassing to cap ring edges. Description Sheaffer Admiral lever fill with 14 carat gold Sheaffer medium nib. Description Sheaffer Admiral lever filler fitted with 14 carat gold Sheaffer two-tone No 5 fine nib. Description An excellent Saratoga Touchdown fitted with Sheaffer Canadian two-tone 14 carat gold nib. Pen made in Australia. Description In Palladium trim and fitted with medium Palladium nib. Converter supplied. Description A very good silver stripe Vac Fill with Palladium trim and fitted with two-tone Sheaffer 14 carat gold fine nib. Very slight brassing to cap ring. Engraved name on barrel. Description A good lever fill Balance fitted with two-tone 14 carat gold Sheaffer fine nib. Fading to top of cap. Engraved name on barrel. Description Very good Touchdown fitted with 14 carat gold Sheaffer fine nib. Gold plated cap. Description A sound cartridge/converter with Palladium trim and Sheaffer Palladium medium nib. Converter supplied. Description Another sound cartridge/converter with Palladium trim and Sheaffer Palladium fine nib. Converter supplied. Description A mint Balance II in dark green fitted with 14 carat gold Sheaffer medium nib. New converter supplied. Description An mint model 800 sterling silver Nostalgia fitted with a fine 14 carat gold Sheaffer nib. Circa 1970. With Box and papers. See full description on Collectors Specials page. Description An excellent model 800 Vermeil Nostalgia fitted with an very fine 18 carat gold Sheaffer nib. Circa 1970. Description An American grey Triumph with medium 14 carat gold Sheaffer nib. Circa1975. Cartridge/converter. No converter fitted. Description An American grey Triumph with fine14 carat gold Sheaffer nib. Circa1975. Cartridge/converter. No converter fitted. Description Circa 1951. A well presented Admiral using the Touchdown filling system. Fitted with a 14 carat Sheaffer fine nib. Description Circa 1960 with stainless steel cap. Fitted with a Sheaffer steel fine nib. Cartridge/converter. Requires converter. Description Black Sheaffer Imperial IV with 14 carat gold medium nib and "Dolphin" shell. In excellent overall condition with original box and papers. Description Black Tuckaway fountain pen and pencil set. Both in near Mint condition with gold filled caps. 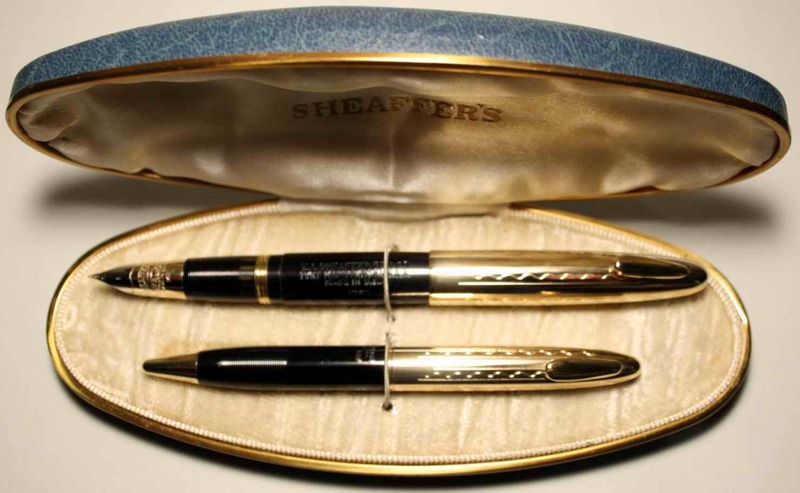 Sheaffer vac fill mechanism and carries a Sheaffer 14 carat gold two-tone "Lifetime" fine nib. Made circa 1945. Original box. Description Maroon Touchdown fitted with a Sheaffer 14 carat gold fine nib. A very good example. Description Circa 1928. In overall very good condition for age and fitted with Sheaffer "3-25" 14 carat gold fine nib. This pen is marked "Service Pen 5 -30" on the cap and "Service Pen Loaned by Chauncey M Depew" on the barrel - the name of an old US pen shop or jeweller named after the US judge and former Senator Chauncey M Depew. Plating wear to cap clip is minimal. Cap bands show no brassing. Description Similar in appearance to Sheaffer "Skyboy" which was produced in 1941 but does not feature the "Skyboy" engraving to the cap clip. This pen was made in Fort Madison but impossible to date with any accuracy. We have doubts about the authenticity of the medium nib which appears to be stainless steel. Features ink view window. 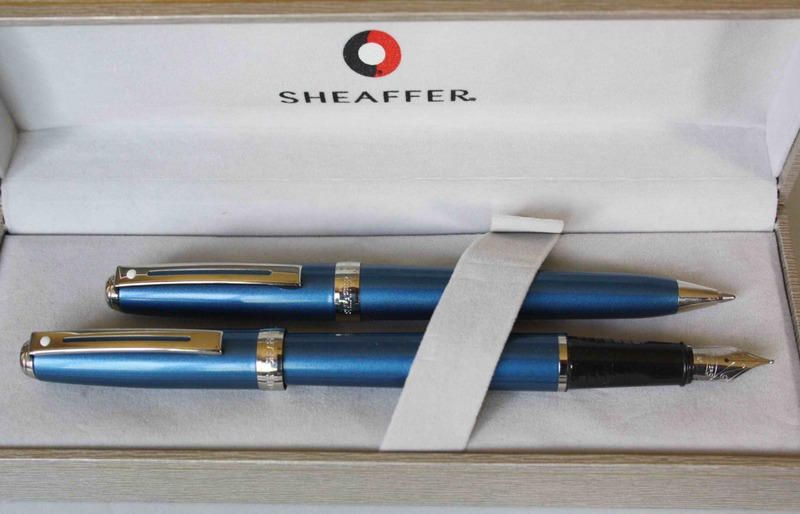 Description Mint condition Sheaffer set featuring fountain pen and ball pen. Fountain pen carries medium Sheaffer rhodium plated nib. Cartridge/convertor filling. Made in USA. Both unused with original box, outer sleeve and papers. Description Circa 1990. In excellent condition and using Sheaffer convertor filling system. Fitted with Sheaffer 14 carat gold inlaid fine nib. Cartridge/convertor filling. Made in USA. Original convertor is in excellent condition. Description Circa 1962. In burgundy and in excellent condition. Carries the engraving of the former owner's name. Fitted with Sheaffer 14 carat gold fine inlaid nib. Made in Australia. In excellent condition.